I’ve been spending a wet Sunday reading the numerous postings by our skiffie friends on their experiences with different types and sizes of oars. They’re very generous in sharing their ideas but this is also quite confusing as it’s clear that there isn’t universal agreement on anything. The purpose of this post is to start a discussion about what we should provide for our first set of oars, bearing in mind that they will be the first of many. The starting point is the rule book, which outlaws spoon oars and the use of carbon fibre but leaves us free to choose any length, section and shape of blade. 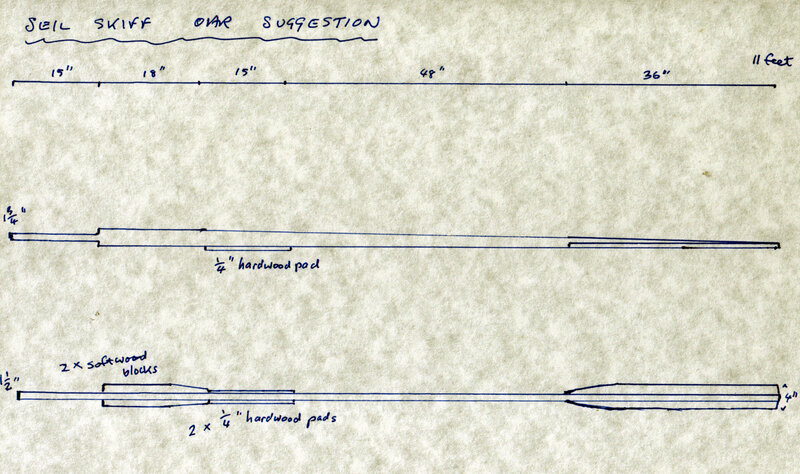 It seems that various lengths of oar have been tried and certain lengths lead to clashes more than others. Some impressive work has been done by Topher Dawson suggesting an ideal length of eleven feet, although some teams row successfully with much longer oars. He also recommends rectangular section oars, which are stronger in engineering terms than round ones, although they can’t be feathered. The latter doesn’t seem to bother existing skiffies. Finally he recommends the use of the cheapest whitewood, easily available in a 38mm x 89mm section and adequate length. He’s provided a sketch incorporating these points and I’ve modified it a little, mainly by suggesting the addition of softwood blocks to give a little weight at the inboard end, which I think could be beneficial (some add lead to thehandles to achieve this). You will see that the 89mm dimension is used fore and aft, where it’s needed. There are thin hardwood strips on three faces to cope with chafe against the kabes. All comments are welcome but unless anyone comes up with something better I suspect our Wednesday regulars will soon start making our first set to this pattern. This entry was posted in Building the boat. Bookmark the permalink.